Patrol Squadron 6, stationed at Naval Air Station Barbers Point, Hawaii, was originally established July 15,1943, as VP-146, at Whidbey Island, Wash. 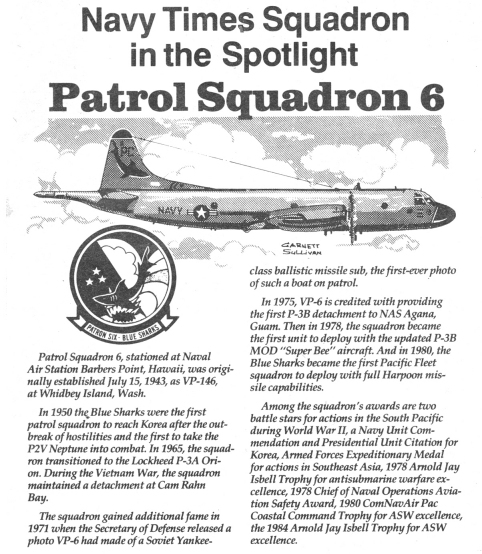 In 1950 the Blue Sharks were the first patrol squadron to reach Korea after the outbreak of hostilities and the first to take the P2V Neptune into combat. In 1965, the squadron transitioned to the Lockheed P-3A Orion. During the Vietnam War, the squadron maintained a detachment at Cam Rahn Bay. The squadron gained additional fame in 1971 when the Secretary of Defense released a photo VP-6 had made of a Soviet Yankee-class ballistic missile sub, the first-ever photo of such a boat on patrol. In 1975, VP-6 is credited with providing the first P-3B detachment to NAS Agana, Guam. Then in 1978, the squadron became the first unit to deploy with the updated P-3B MOD "Super Bee" aircraft. And in 1980, the Blue Sharks became the first Pacific Fleet squadron to deploy with full Harpoon missile capabilities. Among the squadron's awards are two battle stars for actions in the South Pacific during World War II, a Navy Unit Commendation and Presidential Unit Citation for Korea, Armed Forces Expeditionary Medal for actions in Southeast Asia, 1978 Arnold Jay Isbell Trophy for antisubmarine warfare excellence, 1978 Chief of Naval Operations Aviation Safety Award, 1980 ComNavAir Pac Coastal Command Trophy for ASW excellence, the 1984 Arnold JAy Isbell Trophy for ASW excellence.